Jim Peterik is a legend. It's a word thrown about a lot but this guy has a career spanning five decades that has given us a plethora of amazing songs from Vehicle and Survivor to his Pride Of Lions albums. The latter, a collaboration with vocalist Toby Hitchcock, is about to return with new album 'Fearless' (reviewed this issue). Amazing Peterik has managed to improve on their previous albums and bring back what could be termed the 'classic Survivor' sound. Here at Fireworks it's been on constant rotation, so we had to ask Jim a few questions. 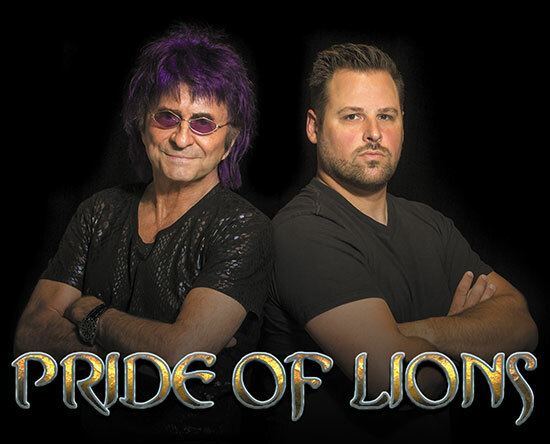 I've been listening to the new Pride Of Lions album and have to say I think it's the best one so far. This is so great to hear! We were feeling that way but you really never know until the people have spoken. For me I'd say it brings to mind the best of both 'Vital Signs' and 'When Seconds Count'. Would you say this is a fair assessment? I didn't consciously set out to tap into any particular era of my songs but I did want to make the songs as accessible as possible, which to me meant to forego some of the more complex chord progressions and modulations of some of the Pride Of Lions albums and make the lyrics as simple but meaningful as possible. Obviously you are most known from your Survivor days. Have you deliberately tried to hearken back to those days or is it simply the way you write anyway? I can tap into practically any musical style because I am a fan of so many types of music, from Hard Rock to Southern Rock to Smooth Jazz, but my heart is really in Melodic Rock. I find the most expression there because I'm able to express big emotions and big melodies which to me are the two biggest elements of Melodic Rock. The album is stuffed full of joyous, upbeat tracks, a real celebration of life. What were your intentions when you started to craft the songs in your mind? Escape! Haha. Sometimes I write my most joyful songs when I'm going through the most trying of times. Without going into specifics, it's been a difficult year for me. I've had to lean on my family and my music more than ever to help me through it. I think positive songs can be a salve for the human spirit. On the first Pride Of Lions album I was also going through some heavy stuff and a very uplifting album came out of it. My songs have always been my best counsellor. Of course, the upcoming birth of my first grandchild did so much to inspire me. It certainly starts with a real uptempo track in 'All I See Is You'. In these days of downloading and being able to just randomise music do you still take care in the running order of an album? I had some sage council with a couple of friends - Paul Braun, my Facebook guru, and Jeremy Holiday. They still value the type of ebb and flow of the old two sided vinyl disc. They helped me fashion a song cycle that really works. Ironically after we sequenced it, Frontiers announced they would also be issuing a vinyl version of 'Fearless'. I just reconditioned my old turntable so I'm ready! For me, it really comes alive with the third track, 'In Caricature'. As with several other tracks I can really hear Jimi Jamison singing it, and that's no criticism of Toby Hitchcock. Do you still hear his voice in your head when you write the songs? Yes, Jimi is still the gold standard to me. I feel so blessed to have found a singer and human being as great as Toby Hitchcock but I still reference Jimi's voice when I'm writing a new song. If I can imagine Jimi singing it, then it passes. Then Toby comes in and makes it his own. Speaking of Toby, his vocals on this album are, to me, the best they have been. He's a beast. He never gets hoarse and his work ethic is unparalleled. He came to Chicago in September and knocked out all twelve tracks in two days. He was that well prepared and in that good a shape. He doesn't drink or smoke and has been working out; maybe that's why his vocal cords sound that good. I have to say the production really works well on this album as well, it sounds superb and so well balanced. I suppose the best word is simply "BIG". Big is good, haha! Back in 1979 I was riding in producer Ron Nevison's Rolls Royce the very day he signed on to produce Survivor's debut album. I asked him, "So what kind of sound do you envision for Survivor?" He thought for a moment then said, "BIG". So I've always strived for that. I feel that my engineer and fellow Ide of March has reached a new pinnacle in sounds and balance – especially drum sounds and my purchase of a new ADK 251 Telefunken clone mic really captured Toby and my voice to a tee. What is your personal favourite, or favourites from the album? It's like trying to choose your favourite child! Very tough – I'm loyal to them all, haha! But ya know, it's often the easiest songs to write that become the most popular. In this case, 'All I See Is You'. I took this song for granted until Toby came to town and said that it was his favourite track. I say "Really?" Ha! Now that it's finished and the video nearly done, I can say it's one of my faves too. The idea came to me watching Beyonce at the Superbowl at half-time. Some people just have that X factor. Michael Jackson had it, Elvis had it – your eye can't go anywhere else! I also love 'Silent Music', which really sets a romantic mood. I love 'Fearless' because it taps into my motivational goals: take the highest ground, stand and fight, you gotta be harder, you gotta be tougher, you gotta be...Fearless! This speaks directly to anyone who has a challenge in his or her life, be it a human rival or a disease such as cancer – you gotta stand up to it and say, "'Bring it on!" You've been at this Rock and Roll thing for nigh on fifty years now, what keeps you going? The love of great songs keep me going. When I was growing up it was Elvis Presley, the songs of Burt Bacharach and Hal David, The Beatles, the Beach Boys. Just to be a junior member of that club makes me very proud. The stories people tell me of how a song that I was a part of, such as 'Eye Of The Tiger', helped them through a rough patch or that they were married to 'The Search is Over', or lost their virginity to 'Vehicle'....hahaha! That is my true reward. You've written songs for many other people, including Sammy Hagar and REO Speedwagon. Are there any memorable collaborations? I think the songs I wrote with 38 Special will stand the test of time. There is a little bit of wisdom in 'Hold On Loosely' that resonates with people. I had a blast writing with Don and Jeff. I also loved writing with Sammy Hagar. In one crazed afternoon in 1981 we wrote 'Heavy Metal' and 'All Roads Leading Me Back To You'! Kevin Cronin is a great friend and collaborator, also the great Brian Wilson. 'That's Why God Made The Radio' by the Beach Boys is one of my biggest hits in recent years, reaching #3 on Billboard. I also interview Joe Vana in this issue and he values your friendship very highly. Do you enjoy mentoring young talent? I value his friendship as well. I've known him since he was a neighbourhood kid on his bicycle knocking on my front door in my suburban home. I'd play him the latest mixes I had just received including an early acetate of 'The Search Is Over'! I was very involved in the first Mecca album and am very proud of that one which includes not only Joe's distinctive vocals and co-writes but also some great performances by the late great Fergie Frederiksen as well. How was it co-writing the 'Songwriting For Dummies' book? Do you feel it was a success in that it works as a guide? I think it has served its purpose well judging by the reports I've gotten through the years. I am hoping to do Volume 3 in the near future to share my latest insights into the wonderful world of song-writing! Of course, there's also your autobiography, 'Through The Eye Of The Tiger', which I confess I haven't read. How long did that take you to do and could you have done it without co-author Lisa Torem's help? It took about a year to write and a lifetime to live. I couldn't have written it any sooner as I had to gain the right perspective on my life. Lisa Torem was there from the beginning, guiding me. Though I didn't end up using the text of the interviews she did with me, just talking it through helped me put my own thoughts into order and it became much easier to put it into written word. Her suggestions were always right on the mark and greatly appreciated. How did it feel, dredging through your memories to get it all down on paper? Some of it was very painful...reliving my father's fatal heart attack and my sister's early death. Also some of the struggles for dominance and direction within Survivor were difficult to re-live. Looking back on your musical life are there a few instances where you think 'That was as good as it could ever get'? There have been many of those moments, I am fortunate to say. Playing to a packed Chicago Theater when the Beach Boys premiered 'That's Why God Made The Radio', getting a standing ovation after every song when the Ides Of March opened for Led Zeppelin in Winnipeg for 30,000 people, the roar of the crowd every time Survivor would launch into 'Eye Of The Tiger', when I heard the final playback of 'I Can't Hold Back'. Really, too many epic moments to count. Finally, the album is out in January through Frontiers. Is there a chance that we might see you and Toby bringing the songs to a stage in the UK? We are premiering songs from 'Fearless' in January in Chicago as part of my World Stage show. I will also be performing an unplugged set in Milan in April as a part of the next Frontiers Rock festival. My agent is now working on support dates for me and Toby. We loved playing England last year and feel there is a real market for Pride Of Lions, and we believe 'Fearless' is the album to break us wide open finally, after five albums and counting!